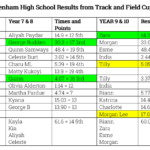 On Thursday 17 May, the English Schools Athletic Association (ESAA) Track and Field Cup took place at Croydon Arena. Twelve schools competed in the competition, which was at a very high standard, and each event is marked against a point score system with 28 points being the maximum awarded for each event. We are really proud of the girls who took part and look forward to their future successes.